Silver Beach Towers will offer you a luxurious place to stay while you explore all the things to do in Destin. This resort is on one of the beaches along the Gulf of Mexico coast. The private beach at the resort is 600 feet long. You will find a variety of things to do at the resort. Relax by taking long walks on the beach. If you want to do something more active, go snorkeling or rent a kayak. Try a paddleboard and then rest on a water mat on the beach. You can order snacks and drinks to enjoy while you are lying on beach. If you want a glimpse of marine life, take a ride in a glass-bottomed boat. You will find plenty to do in other parts of the resort. There are two swimming pools, tennis courts, barbecue grills and a hot tub. Each of the resort’s two towers is fully enclosed. There are three units on every floor, and each unit has a private door. The amenities inside these doors include living areas with views of the Gulf, full kitchens, washers and dryers. Pamper yourself by soaking in the whirlpool tub in the master bathroom or relaxing on the balcony while you enjoy a view of the water. If you are traveling with a large group, you will appreciate the amount of space in a four-bedroom condo with three bathrooms. These condos have room for 10 guests. Eight guests can stay in a three-bedroom condo, and the two-bedroom condos have room for six. There are also two-story penthouses with five bedrooms and five bathrooms. The penthouses will accommodate 12 guests. If you want to leave your luxurious surrounding at Silver Beach Towers to explore the Destin area, you will find plenty to do. Treat yourself to a massage at one of the nearby spas. If you like to shop, you will be thrilled with the number of places to shop in the area. You can find bargains on designer merchandise in the stores at Silver Sands Premium Outlets. You will enjoy browsing through Destin’s art galleries if you are looking for original artwork. There are souvenir shops where you can buy gifts to take home to relatives and friends. 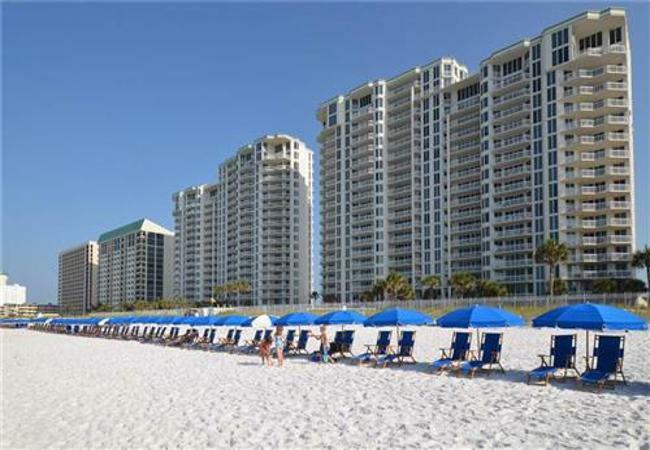 Staying in one of the Destin condo rentals at Silver Beach Towers will make your vacation on Florida’s Emerald Coast a memorable experience.